The creator of a popular online comic strip has come under fire for a benign tweet, sent over two years ago, that indicated thankfulness for his girlfriend being given the opportunity to live. In 2017, Nathan Pyle, sent a tweet expressing gratitude for his girlfriend’s life, mentioning nothing directly about abortion, but including the hashtag #MarchForLife. Upon discovery of this tweet just days ago, the pro-abortion social media mob flew into a frenzy, with people calling for his work to be boycotted and his livelihood threatened. Pyle is a New York Times bestselling author, although in recent years, he has perhaps become most well-known for his “Strange Planet” comic strips, which feature cutesy aliens making random observations about life on Earth. His comics are shared thousands of times on social media outlets, and have garnered a dedicated following. 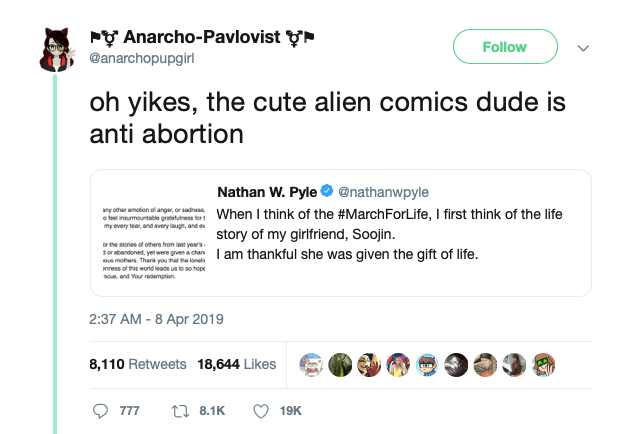 While the backstory behind the tweet is not clear, the insinuation is that Soojin was almost aborted. Pyle said nothing at all about the legalization of abortion, nor did he call for it to be made illegal. 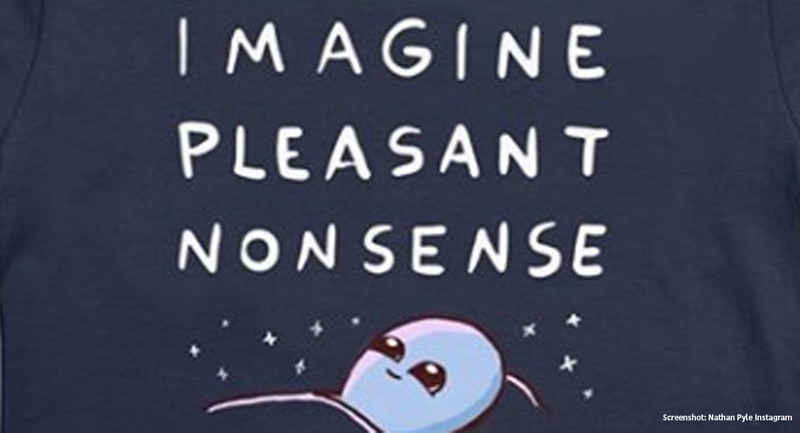 But merely mentioned the March For Life was enough; the user who dug up his old tweet wrote, “oh yikes, the cute alien comics dude is anti abortion,” and that was enough. The social media mob immediately began sharpening their pitchforks. Abortion activists began began harassing him for his apparent pro-life beliefs, some leaving critical messages on his accounts, and overnight, he lost thousands of followers. Pro-abortion media outlets have begun attacking Pyle too; Nylon, for example, reported on the story while ominously saying that “[w]e should be more careful with what we’re sharing.” Since then, Pyle stated publicly on Twitter that he has “private beliefs as they pertain to [my] Christian faith” and that he votes for Democrats because he is “troubled” by “what the Republican Party has become….” He did not mention his previous March for Life tweet. Unfortunately, Pyle is hardly alone when it comes to pro-abortion witch hunts. In 2010, former NFL quarterback and current professional baseball player Tim Tebow appeared in a Super Bowl commercial with his mother. The heartwarming and humorous ad does not mention abortion at all, but merely alludes to the story of Tebow’s life: that while his mother was pregnant with him in the Philippines, his mother became seriously ill and almost lost her son. Doctors advised her to have an abortion, but she refused, and the rest is history. The ad, like Pyle’s tweet, does not mention abortion. Yet it still faced an avalanche of criticism; Bleacher Report called it a “travesty,” while the National Organization for Women actually organized a protest against it. Singer, actor, and television host Nick Cannon has spoken out against abortion and Planned Parenthood in particular, calling the abortion movement today an example of modern-day racism and eugenics. Unsurprisingly, this has made him a target for pro-abortion media outlets like Slate, Jezebel, and Vox. He was attacked especially fiercely after he released a touching music video as a tribute to his mother titled “Can I Live?” — and, predictably, pro-abortion feminists went on a rampage, criticizing the idea of a child being thankful to their mother for giving them life. Presumably, people can disagree civilly on political issues, even contentious issues like abortion. But situations like the ones above show that this has become increasingly unacceptable, as even innocuous statements expressing gratefulness that one’s girlfriend is alive, or that someone’s mother chose life, is now seen as unforgivable. It is deserving of destroyed success and public scorn. Why? Purely because people disagree with their point of view. This level of hatred and animosity are not healthy, yet they persist. Oddly, it once again casts doubt on the idea of the abortion movement labeling themselves as “pro-choice;” people like Pyle, Tebow, and Cannon all merely gave examples of women choosing life, but the reminder that this choice exists seems to infuriate abortion advocates. The message being sent seems clear: we are pro-choice, but only if you make the right choice, which is abortion, and if you choose life, never, ever talk about it. What, exactly, is pro-choice about that?